Members of the Board of Education proposing the bond referendum are allies of the greedy Zisa family, whose onetime control of city government cursed us with the nickname of "Zisaville." Editor's note: The Bergen County Clerk's Election Division updated unofficial results this afternoon, including 499 mail-in and 51 provisional ballots. 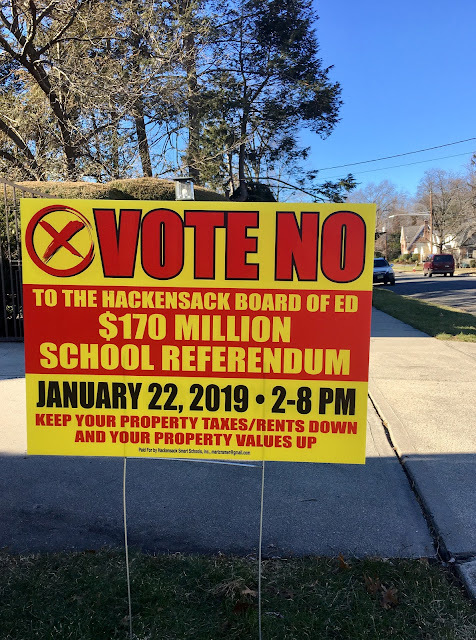 HACKENSACK, N.J. -- In unofficial results, voters on Tuesday rejected a $170 million school construction and renovation proposal and the 30-year tax hike needed to pay for it. Homeowners weren't fooled by a misleading ballot proposal and other inaccurate messages that appeared designed to hoodwink voters. This afternoon, the Bergen County Clerk's Election Division posted unofficial results online, showing a total of 2,917 votes were cast -- 2,265 against the plan and 652 in favor, including mail-in and provisional ballots. The turnout was 13.18% of 22,126 registered voters -- unusually high when compared to April school and budget election in past years. Mayor John Labrosse and other members of the City Council had joined a large number of homeowners in urging a "no" vote on proposal in a special election. Polls were open from 2 p.m. to 8 p.m. The school construction and renovation proposal grew from $165.1 million when first reported by NorthJersey.com on June 30 to the $169.9 million that appeared on the ballot. Most of that -- $101.5 million -- would have been used to build a junior high school and parking garage on the high school campus, with the balance devoted to renovating school buildings that average 100 years old, school officials say. All the work would have been completed to allow the schools to reopen in September 2021, Board of Education President Lara L. Rodriguez told NorthJersey.com. But the property tax hikes needed to pay off the borrowing assumed school officials would receive more than $41.3 million in state aid, which wasn't guaranteed. The original ballot proposal submitted by school officials tried to fool residents by claiming the average property tax impact would be "$308.66 over 30 years, based on the average assessed home" -- or only about $10 a year. 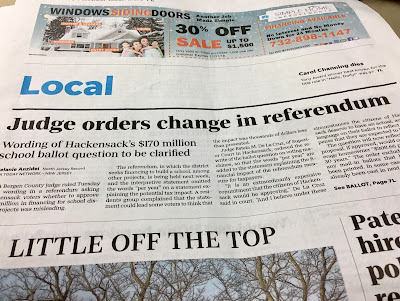 But last week, after a homeowners group sued school officials, a state Superior Court judge in Hackensack ordered county election officials to print new ballots that state approval "would cost the average homeowner '$308.66 per year, for 30 years.'" 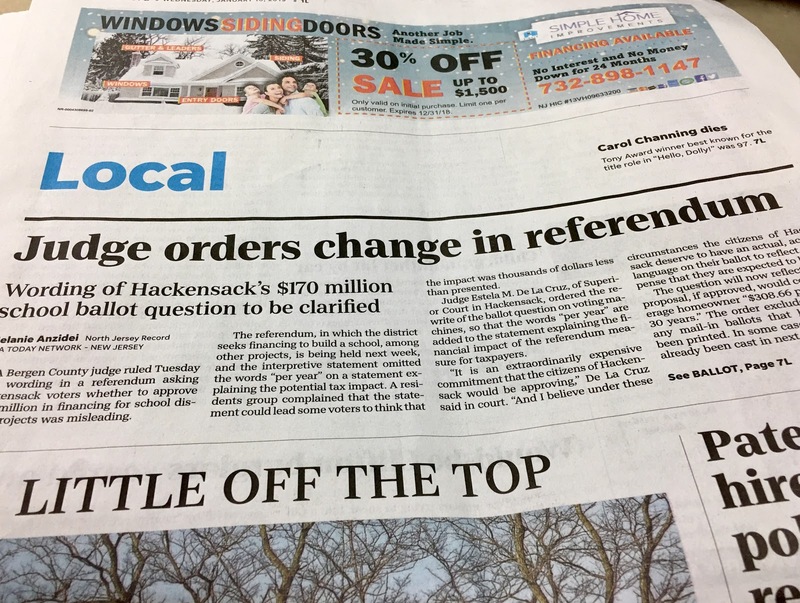 "It is an extraordinarily expensive commitment that the citizens of Hackensack would be approving," said Judge Estela M. De La Cruz, explaining why she ordered a change in the language to reflect the potential true cost. Many homeowners would have paid far more. My exposure would have been about $650 a year for 30 years or a total of $19,500, but others would have paid even more every year. And everyone's annual payment would increase, if their assessment or the city tax rate, or both, go up in the three decades after schools reopen. Unfortunately, the court ruling didn't change the original misleading language in mail-in ballots that were sent out to voters on Dec. 21 or on sample ballots that all voters received last week. And messages from school officials continued to mislead voters by dramatically downplaying the potential property tax hikes. A postcard about the bond referendum in both English and Spanish -- sent to homes by Hackensack Public Schools -- claimed the cost would be "less than $1 a day [menos de $1 por dia] for homes assessed at the city average." An open letter from Rosemary Marks, acting superintendent of schools, also falsely claimed "the tax impact...would be an average of $308.66 per year or less than $1.00 per day." The letter, which made no mention of a potential 30-year tax hike, was dated Dec. 31, 2018, and written in response to one from Mayor Labrosse, who opposes the plan. "Tenants can also expect to pay higher rents if it [the bond proposal] passes." "Join Mayor Labrosse and vote no on the $170 million school bond and big tax increase this Tuesday!" The $169.9 million proposal had been put together in the past 5 years, Deputy Mayor Kathleen Canestrino said at a City Council work session on Jan. 8, but school officials refused to divulge any details until recently. "What's the rush?" Canestrino said in a phone interview on Monday, noting school officials haven't completed a re-registration to make sure only students from Hackensack and sending districts reap the benefits of taxpayer-supported schools. City officials support a plan to alter and renovate existing schools, and upgrade heating and air conditioning at a total cost of $68.3 million, with a potential average property tax hike of $108 a year for 30 years. But school officials refused to split that part of the proposal from the $101.5 million in new construction, leaving voters no choice but to reject the entire plan. As of last April, Hackensack had 23,401 registered voters, according to the Bergen County Board of Elections (the county clerk put the number of voters at 21,303). In the April 2018 school election, three challengers backed by the City Council defeated school board President Jason Nunnermacker, a lawyer, and two other incumbents. But the nine-member Board of Education remains in control of the Zisa family political dynasty. And Anthony C. Zisa is an English teacher at Hackensack High School. In recent years, Zisa loyalists on the board have driven the annual school budget over $100 million -- exceeding the municipal budget -- boosted fees to the board's lawyer, raised administrative salaries and postponed renovation of old schools. In unofficial results last April, only 1,629 voters or 7.65% of those registered cast ballots -- more than twice as many as in previous school board elections. Only 1,142 of those voters voted "yes" or "no" on the tax-levy proposition, which was approved 695-447. That means only 695 out of 44,000 residents approved the use of $82.8 million in property taxes to support the $117 million school budget. About 45% of your property tax bill goes to support the city's schools, and that percentage would go higher with approval of the irresponsible $170 million school construction and renovation plan. A Superior Court judge's ruling last Wednesday left uncorrected the tax impact as stated on mail-in and sample ballots for the special school election on Tuesday. On Thursday, I hand-delivered three mail-in ballots with "no" votes (from my wife and I and our college-age son) to the Board of Elections in Room 310 of the county Administration Building in Hackensack. If you mail your ballot, make sure to use two stamps. An official in the county Election Division said she didn't know how many words are in the $170 million ballot proposal, but that the actual ballot voters will see in the voting booth is not much bigger than the sample ballot shown here. If you haven't seen it before you go to vote, good luck trying to read the hundreds of words, dollar amounts, percentages and so forth in the small print necessitated by duplicating the proposal in both Spanish, center, and Korean, right.